Sources Of I are a band from Italy that plays a mixture of depressive black metal and doom and this is a review of his 2015 ep "Faces" which will be released in August by Kaotoxin Records. A very dark and melodic sound starts off the ep before adding in more heaviness and a blackened doom metal style and when vocals are added into the music they are high pitched depressive black metal screams and the music also goes into more of a fast and raw direction at times along with a decent amount of blast beats. Throughout the recording there is a great mixture of slow, mid paced and fast parts and there is also a brief use of spoken word parts and one of the songs is very long and epic in length and there are also some deeper vocals being utilized at times and they also manage to get atmospheric with the guitar riffs and when solos and leads are utilized they bring more of a dark, melodic and modern black metal feeling to the recording and all of the musical instruments have a very powerful sound to them. 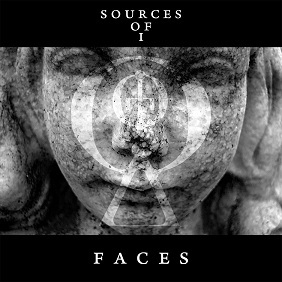 Sources Of I plays a musical style on this recording that mixes the raw, atmospheric and depressive sides of black metal together and also adds in a good amount of doom metal elements to create a very dark sounding recording, the production sounds very powerful while the lyrics cover dark philosophies, negative introspection and the poetry of Emile Verhaeron. In my opinion Sources Of I are a very great sounding mixture of black and doom metal and if you are a fan of those musical genres, you should check out this band. RECOMMENDED TRACK "Discripancy of Life". 8 out of 10.